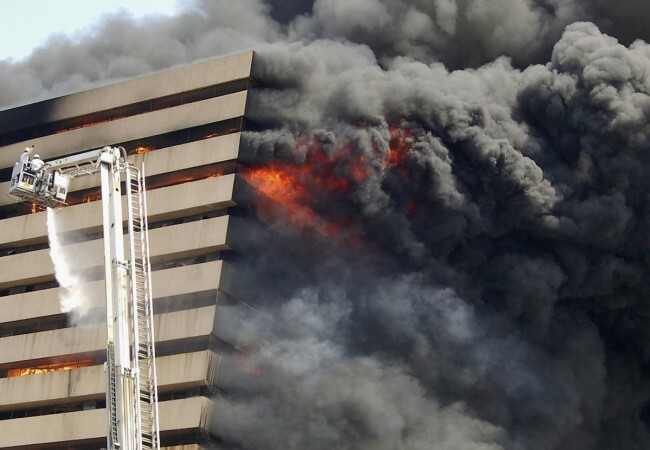 A fire has broke out at the 20th-century building in the Nairobi Central Business District (CBD) on Monday afternoon. The immediate cause of the fire is yet to be established, however, firefighters responded swiftly and were able to contain the fire that had razed down several structures and establishments within the building. No casualties have been reported by the time of publish, with witnesses stating that the fire brigade were swift in their response. Value of damaged property is also yet to be established as authorities are still at the scene. The building hosts an IMAX movie theatre, several Forex bureaus, and clothing stores. From the photos taken at the scene, the inferno mostly damaged the ground floor that housed several dry cleaners and forex bureaus. Several Forex Bueaus >>>>>> Several Foreign Exchange Bureaus??? Are these are the venues for laundering fake foreign currencies which were recently found in Kenya ???? Destroying the evidence? Wapi Kalonzo Musyoka .Kalonzo wacha kufuata matako ya Raila Odinga go home and help this kamba family . Fire is the Way to go !Poor Kenyans has nothing to lose If Kikoba burns daily Why not DBD burn Burn Nairobi CBD daily there is nothing to loose for the common Nairobians. More fire please.Let Nairobi burn, Set it on fire Fire fire fire fire EH Eh Fire will burn you.